Okay so last week while I was sitting in the hospital waiting on Dustin to have his surgery, I was on Facebook, naturally and saw an ad on the side for a company called Endurance Obsession. I checked it out naturally and found some pretty good looking shirts. I ordered one (seriously, like I wouldn’t buy a shirt for $25 bucks). Before I talk about EO, I want to tell you a bit about them from their web-site. They are triathlete’s obsessed with triathlons! They are giving back to the sport by helping juniors with entry fees (10% of net proceeds benefits a junior that might not get to enter a race because of financial issues). They have started their own recognized team with USAT and are planning big things for 2012. I love the fact that they are giving back to the triathlon community to help it grow! 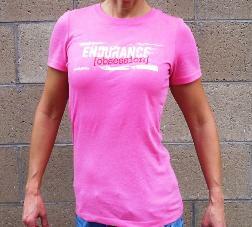 So I ordered the obsessed with 140.6 shirt from Endurance Obsession (in the pink as shown). This shirt is super soft and comfy. I’m just thankful to have found something that totally describes me at this time! They have both men’s and women’s tees and let me tell you the softness of it is so worth the $25 bucks! Love it! I wore mine the other night and folks instantly took notice and someone said, your shirt says it all! lol. So make sure you check ’em out if your looking to add to your wardrobe a great shirt (I’ll be wearing this when we’re out in Kona for world championships!)!! Donna….thanks for the awesome write up!! We are just getting started and want to let everyone know that if you're a fun loving triathlete, you should be hanging with us!! My wife and I are thrilled to see the company grow and give something back to the next generation of crazies!!! !Hope to see you at a race soonMichael Giudicissi Endurance Obsession. I admit, I like those, a start up company, maybe more products will be coming soon, the coolest shirts are marketed to a certain market, with over 2 million people doing at least a sprint, as reported by USAT, there is a small population who has gone long.